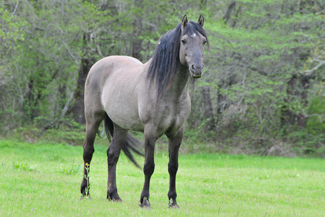 High producer of grulla foals & 100% producer of either a grulla or dun foal. 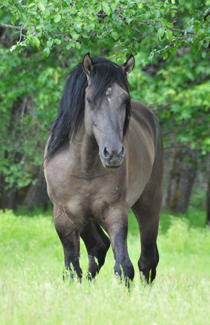 Tesoro is a beautiful grulla Kiger stallion captured from the Kiger Range on September 11, 2003 as a seven year old. He was selected for our breeding program from numerous Kiger stallions available for adoption because of his kind eye and calm nature. From the first day Tesoro arrived he displayed a very docile attitude w ith no desire for dominance. He easily adapted to his domesticated life and continued to display this gentle and calm nature with an extreme willingness to please. His intelligence is impressive Tesoro stands 15.1 hands, has extremely high knee action, and is smooth and majestic in his movements. He has a nice well rounded hip, long legs, great Kiger conformation, beautiful head, and strong Kiger dun factor. 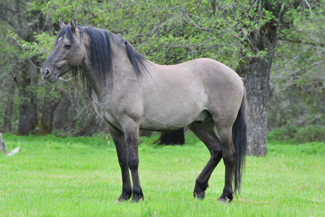 He has proven to be a very strong grulla foal producer with the unique Kiger primitive markings. He passes these qualities on to his foals making his foals exceptional in mind and body. This Kiger stallion is a real eye catcher! Tesoro was destined to have a career as a working ranch horse with his natural cow sense. 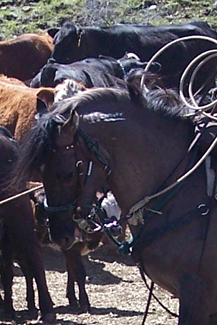 His ranch accomplishments include gathering, penning, sorting, roping, and branding. He proven his awesome attributes as a true mountain horse while rounding up cattle at fall round up on rugged mountains . 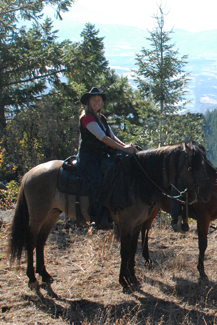 He is now one of the top mounts at Three Creeks Ranch always carrying his rider with care and smoothness. In addition to proving that he is worthy as a ranch horse, Tesoro can easily change gears and proudly represent the Kiger horse in other competitions and events. 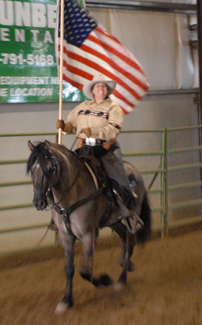 Tesoro has been ridden in parades and exhibitions, carrying the flag very proudly. It was an honor when he was chosen to be the lone horse to open ceremonies at Equifair in Grants Pass by presenting the flag and colors, taking all the excitement in stride. Tesoro attended the annual Oregon Mounted Sheriff Posse competition and placed 3rd in an open stock horse class out of 15 horses. He also competed in the annual drill team competition and took 2nd in the 4-man drill quad. Tesoro entered into a series of Trail Trial competitions and at one event he took 1st place competing against 17 competitors in his division. Tesoro placed 3rd highest overall score in his division for the series with a total of 29 competitors. Changing gears once again, Tesoro was entered into a Gymkhana competition and out of 15 competitors he placed 5th. In addition to all of these competitive sports, Tesoro is used as a lesson horse for junior riders. He carries these young riders as though precious cargo were aboard. Many comment on his quiet manner especially while he is around other stallions or mares. He spends his spare time in the pasture with the geldings. He is intelligent, willing, and well mannered. Tesoro del Corazon, truly one versatile Kiger! Stud fee $750 for 2014 LFG , breeding to a limited number of outside mares. Legacy is almost a twin to his sire, in looks as well as dispostion. He is kind, willing, intelligent, gentle, well manered, and a delight to handle! Legacy is currently in training and is egar and wants to please and only beginning to show his full potential. He will soon be following in his sire's footsteps in becoming a very versatile and safe mount. He will prove to be a true asset to the Kier mustang breed. 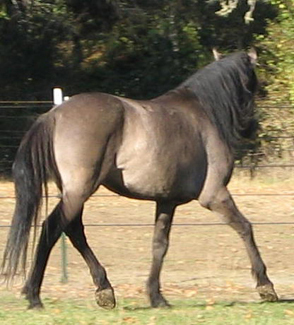 Legacy was bred to several mares at Three Creeks Ranch before departing for his new life in Germany. He will be a standing stud there for owner Jens Lam. This Kiger stallion is impressive and will stand out in the crowd! Now located in Germany - Contact Jens Lam for breeding to this beautiful stallion if you live in Europe! Kigers for sale. 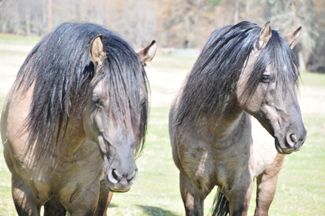 Kiger mustang stallions at stud. Kiger mustangs for sale. are under copyright and may not be used or copied in any way.